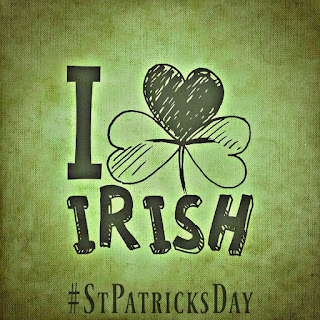 Who’s ready for St. Patrick’s Day? Anyhow, St. Patrick’s day is always the perfect excuse play with Guinness and kinda accidentally have half a bottle left that someone has to drink – I mean, you can’t waste, right?? This is, unless you’re putting this in the crockpot at 7:30 in the morning and have to go teach 3rd grade. The drinking the rest of the Guinness is rather frowned upon, so you have to put it in the fridge and have slightly flat Guinness after work – like I said, shameful to waste. How smokes, where the heck were we going there? The ingredients in this pot roast provide amazing layer of flavor! 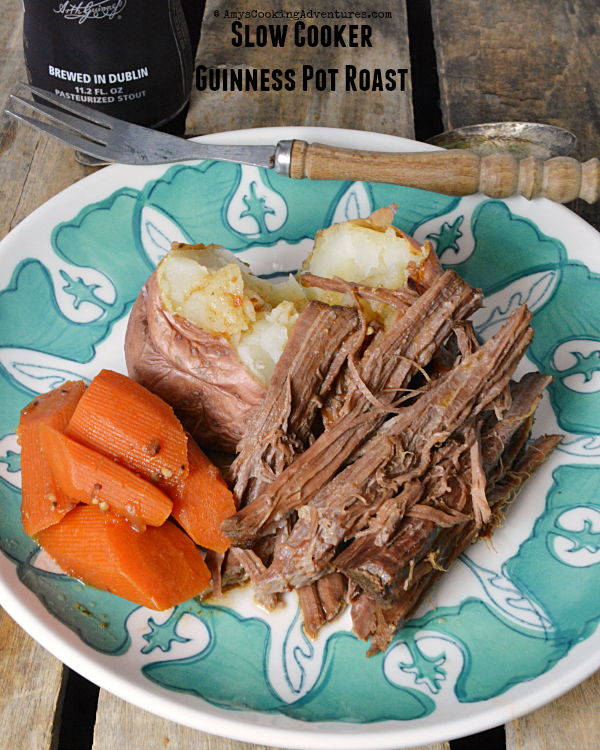 In fact, this is one of the most flavorful pot roasts I’ve made! It’s a delicious change of pace! Need more St. Patrick’s inspiration? 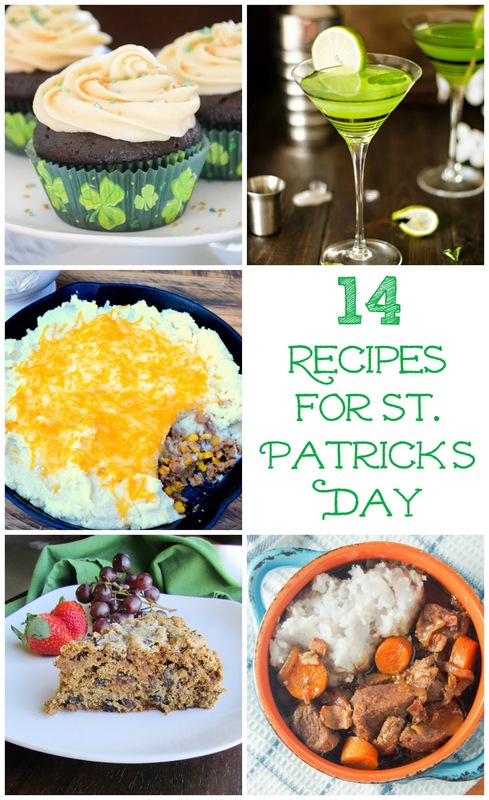 Check these recipes out! St. Patrick's Day is just around the corner. It is a great time to celebrate the Irish in all of us, even if there isn't any! 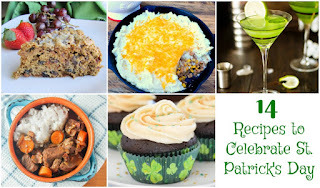 There are a lot more ways to celebrate than drinking green beer. So Jan from The Tip Garden and Carlee from Cooking with Carlee got us together to share our best St. Patrick's Day inspired recipes. There is sure to be something for everyone! Place the onions, carrots, and garlic in the bottom of a 4 quart slow cooker. Place the beef on top. Pour over the tomato sauce, stout, and broth. Stir in the mustard and Worcestershire. Season the roast liberally with salt and pepper. Once finished cooking, shred the beef and serve over potatoes, using the juices as gravy, if desired. Or serve on rolls with juice for dipping. Time to - finally - unbox my slow-cooker, me thinks!! What a great looking plate, Amy. Thanks for sharing. I need some new slow cooker meals. This sounds like a must try! What would working moms do without a crockpot? 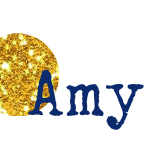 Great recipe Amy and just as a head's up, the link to this site is broken, you might want to let Jan or Carlee know.